A Southern Baptist megachurch pastor in North Carolina, already under fire for buying a $1.6 million house, is in the spotlight again for “spontaneous baptisms” that turn out to be not nearly so spontaneous. Steven Furtick, 34, routinely draws about 14,000 worshippers to several campuses of Elevation Church in and around Charlotte. The church, launched in 2006, have been listed by Outreach magazine as one of the top 100 fastest-growing churches in the country. Part of that growth has been attributed to Elevation’s flashy baptism ceremonies, particularly as the Southern Baptist Convention grows increasingly concerned about declining baptism rates as a key measure of evangelism and church vitality. But a new report from NBC Charlotte suggests that Elevation’s supposedly spontaneous baptisms are carefully planned ahead of time, with people planted in the congregation to start the walk down the aisle." The article goes on to explain the 'How-To' of Elevation Church's 'spontaneous' baptism, right down to the percentages of what sized clothes to order to give to the wet baptizees after they come up from the water. I knew about Furtick's Elevation Church's non-spontaneous baptism before. I wrote about Furtick's deception last November. What hurts is the shame we feel by sharing the name 'Christian' with such a one as Mr Furtick, and having that shame exposed to the mocking, unbelieving world. What hurts is the harm done to the name of Jesus, and the unbelievers who turn from our precious Savior in scorn. I wasn't saved until I was 43 years old. I lived through the televangelist scandals of the 80s and 90s. Jimmy Swaggart, Jim Bakker, Oral Roberts (remember his 900 foot tall Jesus vision?) all were fodder for me to be convinced that Christianity was a crock. The arrival of cable television in the 80s and the rise of money grubbing televangelists beamed into my home didn't help my attitude. Never having been inside a church, the cable programs and the newspaper headlines were the church. At least they were the face of it, for me. Chicanery, greed, and deceit exhibited in these Christians were certainly obstacles for me to come to Christ. Who wants to become a part of a religion where people were always falling from grace, exposed as liars, shown to be deceptive, and say and do ridiculous things all the time? Now, I know that in His sovereign way, He elected me to salvation and the moment was ordained from before the foundation of the world. (Ephesians 1:4). But on the other hand, schemes and wiles such as Mr Furtick's are a stumbling block. And the larger issue, now that I'm saved, is shame that the name of Jesus is associated with tricks like Furtick's and done in church no less. In researching this post, I came across a How-To from the internationally-known speech-making organization- the Toastmasters. It is called "How to Plant a Shill in the Audience". It should be noted that at least the Toastmasters admit that planting a shill is a "trick", "deceptive", and "sneaky." They also advise revealing to the audience at the end of the trick that the shill was indeed a plant. It should be noted that the supposed Christian, 'Pastor' Furtick, makes no such admission about his shills. Click the image to enlarge. 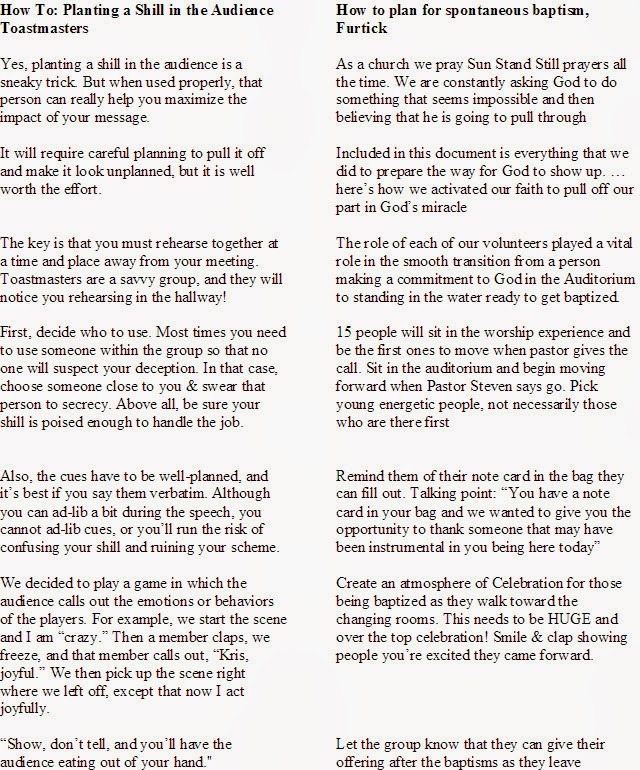 You will see eerily similar language between the Toastmasters how-to for manipulating an audience by using shills during speeches, and Furtick's manipulation of his audience by using plants during the spontaneous baptisms. My only comfort in all this is that Jesus is King. He will repay. And I'm looking forward to it. I long for the day when His name will be besmirched in word or deed no more. There is definitely an art to shill-planting, but it can be a highly useful tool in your bag of speaking tricks. Use it sparingly and wisely. Plan it out carefully and it will serve you well. Furtick is up in my neck of the woods and it's long past time the SBC called this man out and rebuked him. Disgraceful. Before my salvation, I would laugh at and mock these deceivers, now I mourn for the shame they bring on the name of Christ. Ok: So, Furtick says in the document, "We are constantly asking God to do something that seems impossible and then believing he is going to pull through". Then: Furtick uses shills to accomplish the "impossible" feat that he asked "God" to do. 1 But false prophets also arose among the people, just as there will also be false teachers among you, who will secretly introduce destructive heresies, even denying the Master who bought them, bringing swift destruction upon themselves. 2 Many will follow their sensuality, and because of them the way of the truth will be maligned ; 3 and in their greed they will exploit you with false words ; their judgment from long ago is not idle, and their destruction is not asleep. It's so ironic..I just saw Steven Furtick's Hey Haters (http://www.godtube.com/watch/?v=FFCM2CNU) video over the weekend and was so saddened and sickened by it...I grew up in a Christian home and have been saved for 28 years and never have I seen anything like this. I sent a link to the video to my son in Charlotte and when he wrote back he mentioned the so-called spontaneous baptisms. I brushed it off as too hard to believe. I so wish I hadn't been wrong. All I can think is if this disgrace is so disgusting to me as a sinner, what must it mean to our perfect, holy Savior? Unimaginable. "...The faith healers and health-and-wealth preachers who dominate religious television are shameless frauds. Their message is not the true Gospel of Jesus Christ. There is nothing spiritual or miraculous about their on-stage chicanery. It is all a devious ruse designed to take advantage of desperate people. They are not Godly ministers but greedy impostors who corrupt the Word of God for money's sake. They are not real pastors who shepherd the flock of God but hirelings whose only design is to fleece the sheep. Their love of money is glaringly obvious in what they say as well as how they live. They claim to possess great spiritual power, but in reality they are rank materialists and enemies of everything holy." The Word of God has an admonishment for the above and the followers of same.
" For many deceivers are entered into the world, who confess not that Jesus Christ is come in the flesh. This is a deceiver and an antichrist. Look to yourselves, that we lose not those things which we have wrought , but that we receive a full reward. Whosoever transgresseth , and abideth not in the doctrine of Christ, hath not God. He that abideth in the doctrine of Christ, he hath both the Father and the Son. If there come any unto you, and bring not this doctrine, receive him not into your house, neither bid him God speed : For he that biddeth him God speed is partaker of his evil deeds" (II John 7-11). The believer's love for and loyalty to Christ and the Word of God must lead him to reject and count as an enemy of the gospel of Christ any professed believer (minister or layman) who is not fully committed to the "doctrine of Christ" and the apostles (v. 9). All who distort and oppose the N.T. faith must not be received into the fellowship of believers. God warns the true believer to watch lest he himself accept false teaching (v. 8). The believer must consider all supposed Christian teachers who do not abide in the doctrine of Christ as teachers who do not have God (v. 9) and who are accursed of God (Gal. 1:9). God commands the believer not to give encouragement or financial support to, or to remain under, the ministry of such teachers. To do so is to join them in opposing God and His Word and to come under the same condemnation as the compromising teachers (v. 11). These authoritative words of John, inspired by the Holy Spirit, are an offense to many in the church today. They feel John's admonition lacks a loving attitude or a spirit of unity. However, John's instruction will seem wrong only to those who have little concern for the glory of Christ, the authority of God's Word, and people whose eternal souls are destroyed by casting aside God's truth.